We adore these delicious Reese’s Peanut Butter Candy Chocolate Cookies! 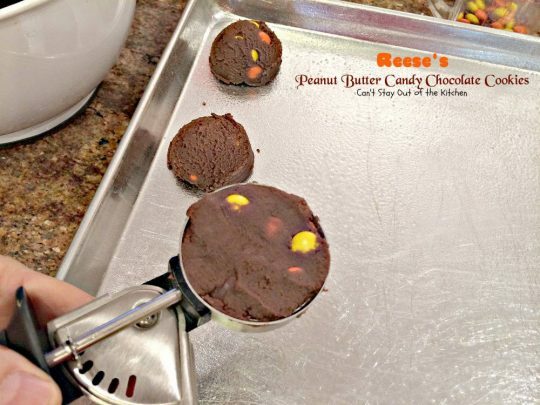 Each bite is filled with Reese’s pieces peanut butter candies. Oh, my! These cookies taste spectacular! Such a rich, chocolaty flavor, and luscious peanut butter taste added by the candies in every bite. They are extraordinarily delicious. We have made these wonderful cookies several times for our yearly Christmas Cookie Extravaganza. Everybody loves them. You will too! 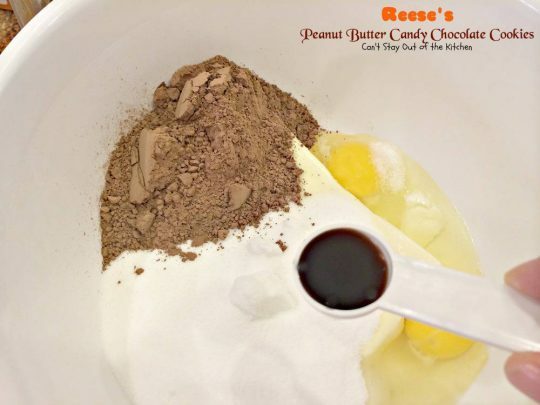 I found the recipe on the back of a Reese’s peanut butter chips package back in the 1980s. Seriously, some of my best recipes have come from the back of packages and boxes! And this is one of them. This is the first time I’ve made it with Reese’s pieces candies, although last year I made it as a brownie with both peanut butter chips and Reese’s pieces candies. That was incredibly rich and decadent. 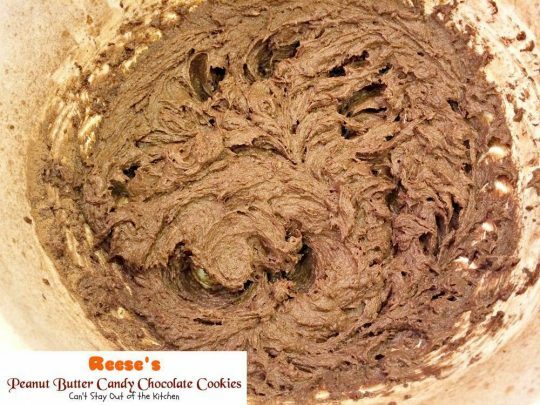 If you’re looking for a delicious chocolate cookie recipe with Reese’s peanut butter candies, this is the recipe for you! 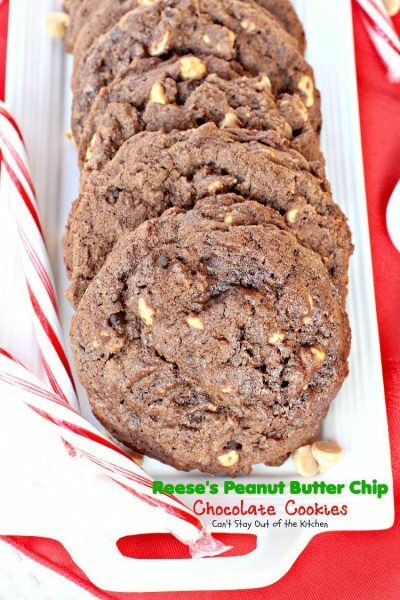 This is a great cookie to bake for the holidays as almost everyone loves chocolate, and many people love the combination of chocolate and peanut butter. 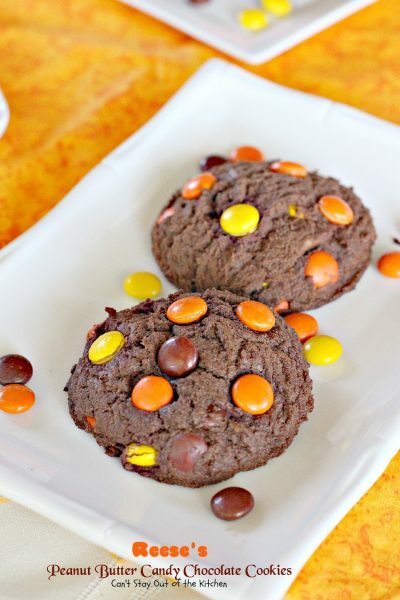 It’s a chewy cookie with just the right amount of crunch from the candies or chips. 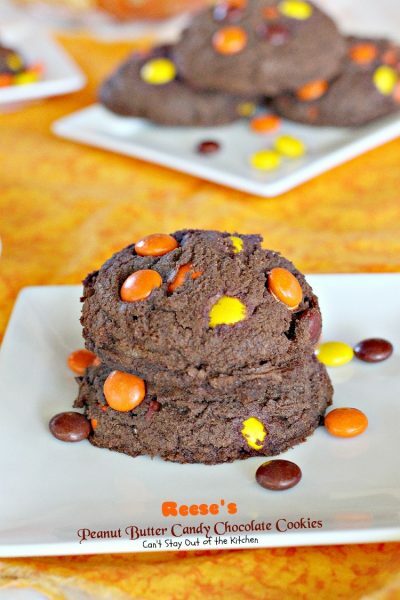 Sit down with a tall glass of milk and enjoy these tasty treats. Be kind–share some of these with your neighbors and friends too. Merry Christmas! When I originally posted this recipe in November 2012, my pictures were too busy, taken with a poor camera and in poor lighting, making them unattractive and not very helpful in showing what these cookies truly look like. I recently remade these cookies (October 2014), for our Christmas Cookie Extravaganza – 2014 and retook the pictures. These cookies are excellent for holiday baking, but they’re also a great way to use up leftover Reese’s pieces candies that come in the small packets. I used both regular sized Reese’s pieces candies and the miniature candies. I personally liked the larger ones the best. Regardless of which ones you use, both are spectacular, as is this cookie! 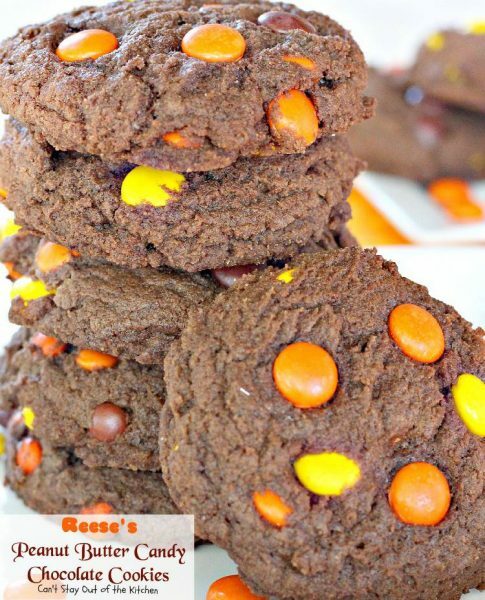 Reese’s Peanut Butter Candy Chocolate Cookies are sensational! 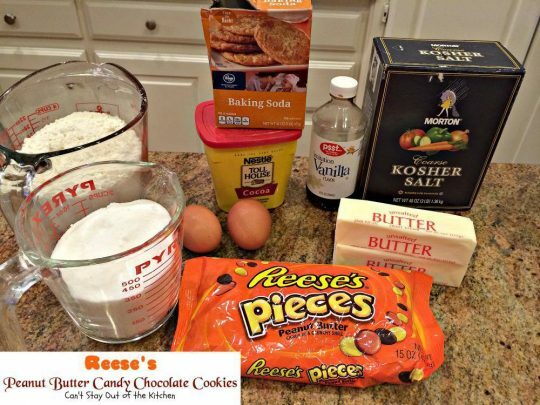 You can use Reese’s miniature or regular sized peanut butter candies in this recipe. Both work fine. 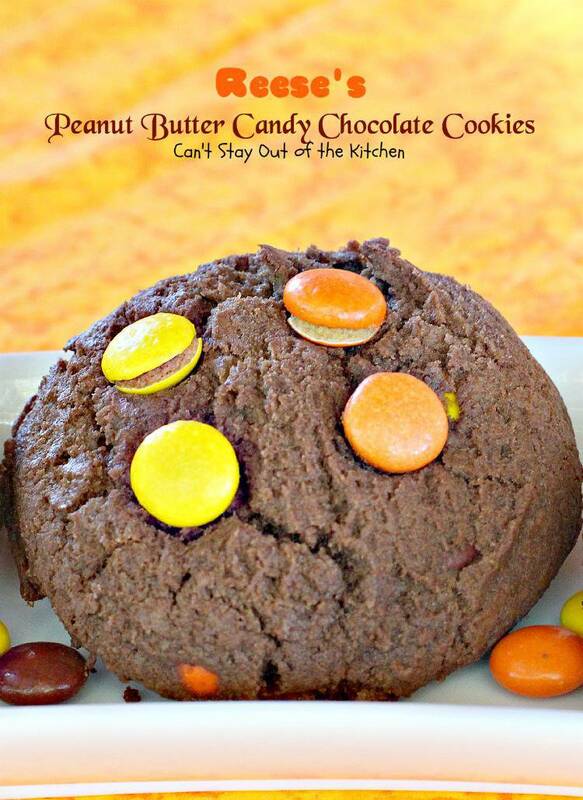 Pass a plate filled with Reese’s Peanut Butter Candy Chocolate Cookies around to your coworkers and in no time they will be all gone. Soften butter and put in large mixer bowl. Add sugar, eggs, cocoa, salt, baking soda and vanilla. Mix all the ingredients with an electric mixer until smooth. Add UNBLEACHED all-purpose flour. Bleached flour toughens cookies and cakes. Add Reese’s pieces candies. Stir all the ingredients together with a wooden spoon. Don’t use an electric mixer or it will toughen cookies. Scoop cookie dough with a 1/4 cup ice cream scoop and place onto cookie sheets sprayed with cooking spray. 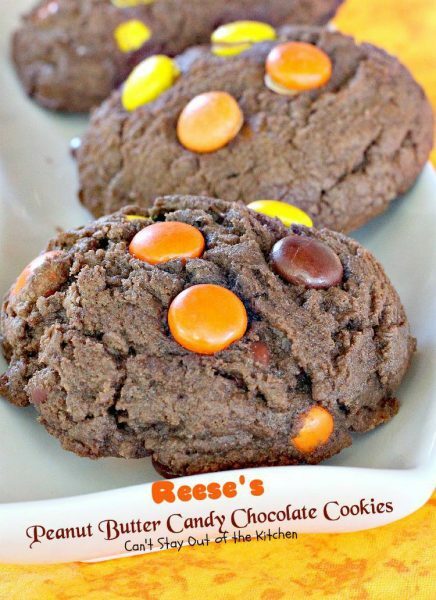 Place reserved Reese’s candies into the tops of each cookie. Bake at 350 about 12-15 or until cookies test done. Reese’s Peanut Butter Candy Chocolate Cookies are great for holiday baking and holiday parties. 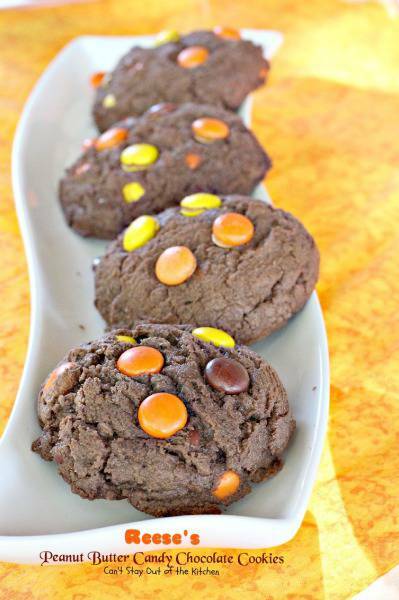 Everyone loves these rich, chocolaty cookies. 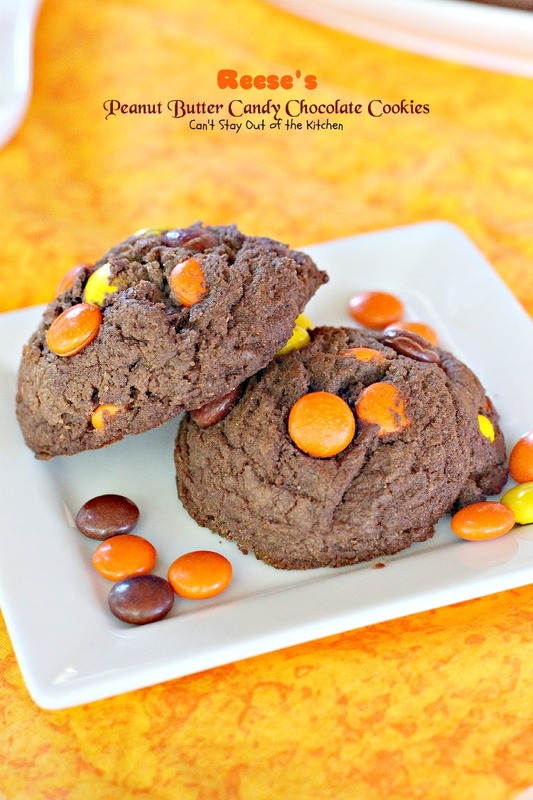 Wonderful chocolate cookie with Reese's mini pieces peanut butter candies in the cookie. Easy and delicious. 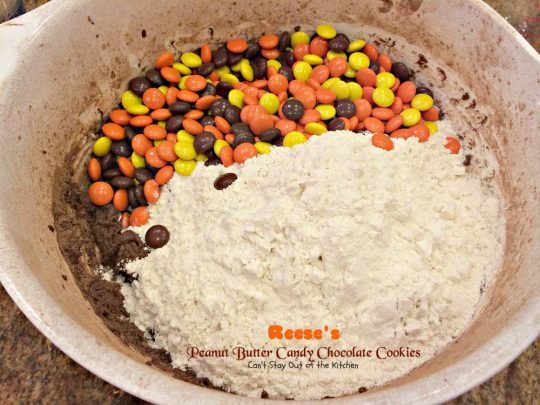 Measure out about 1/3 cup Reese’s pieces. Set aside. 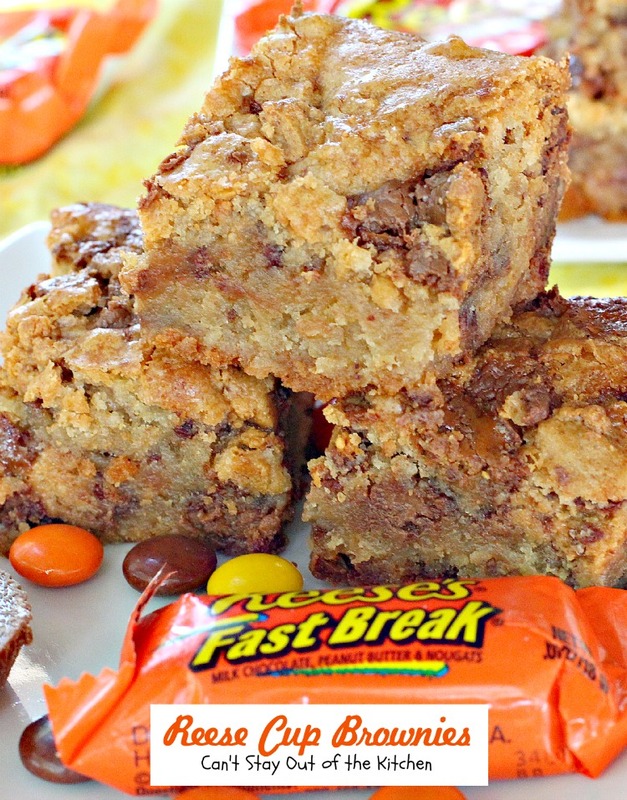 Stir in UNBLEACHED all-purpose flour and Reese’s peanut butter candies. 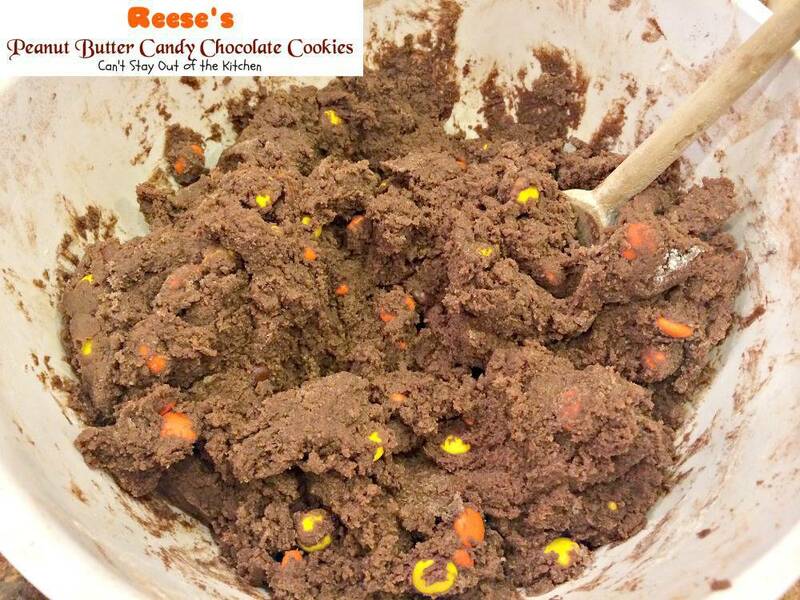 Scoop dough with a ¼ cup ice cream scoop and drop onto cookie sheets that have been sprayed with cooking spray. 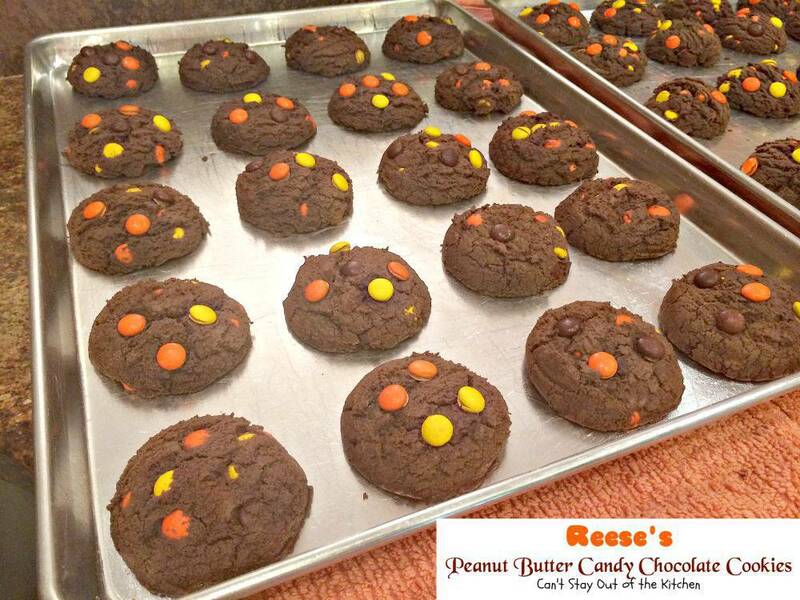 Place about 4-6 Reese’s candies into the top of each cookie. Bake at 350° for 12-15 minutes or until cookies test done. Cool in cookie sheets for a few minutes before removing to wire racks. Wonderful chocolate cookie with[url href=”http://www.hersheys.com/reeses/” target=”_blank” title=”reese’s pieces”] Reese’s[/url] mini pieces peanut butter candies in the cookie. Easy and delicious. Your family will love these wonderful chewy cookies. Every bite has the lovely crunch from a Reese’s miniature peanut butter candy. Yum. Reese’s Peanut Butter Candy Chocolate Cookies are great cookies for tailgating parties, baby showers and birthdays as well! If you love peanut butter and chocolate, you will LOVE these amazing cookies. They are fabulous! 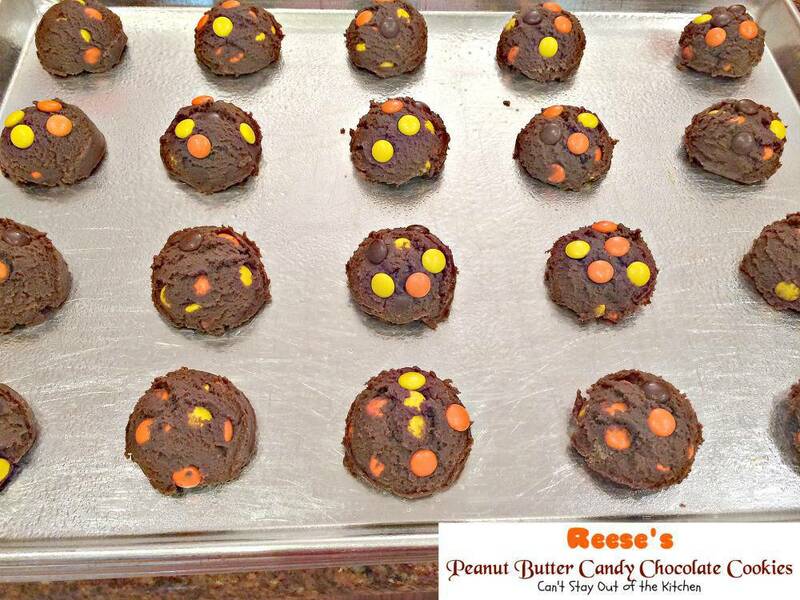 I make them with either peanut butter chips or Reese’s miniature peanut butter candies. Both work excellently. They are perfect for Christmas! BTW thanks for following my blog I hope you find the recipes enjoyable. Please stop in anytime. Looks so good!!! Love the Reese’s and chocolate! Ah, another winning combination. Resses Pieces & chocolate. MMMMM.. Love it. Have a great Thanksgiving Teresa. You, too. Yes, it is a great combination. And really easy to make too.